Seriously just thank you. I have a boy and a girl 19 months apart (my girl is the raging toddler these days). And like I saw another mom say, I feel defeated every moment of every day. It’s literally 7 in the morning and I’ve already dealt with screaming, crying, and being told “no” several times. I’m over my day already. 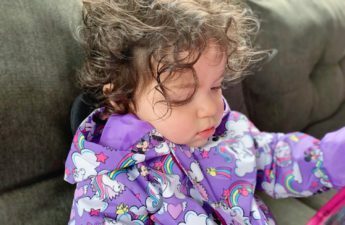 I’ve spent the past few days searching Pinterest and other sites for the “perfect” way to discipline and how to control Mommy tantrums. I’m exhausted and I literally read this article agreeing with every single word and nodding my head as if you were talking straight to me. Glad to know I’m not alone. You’re right, this too shall pass! +1 here!….just going though depressione xactly because of this. We just had baby no.4 and Dad needs togo out to study all day.. We homeschool and all and I know they are all 4 blessing but dealing with toddlers and having a newborn is really demanding, I have been extremely angry and sad these days and your article deifnitely rang a bell. I just hope to find hope and joy again as life circulstances are also adding stress to the situation. I just wish I could be a better, kinder mom…I think indeed we lust take things one day at a time and surrender in action to God – it’s what Jesus Christ did and that’s ho he could handle being so kind and loving to mean people….surrendering his impulses to doing good…. Lots of courage to you all, it isn’t easy. Thanks for the article though.. Thank you so much! This post was a God send via Pinterest. I’ve got two beautiful, strong willed baby girls who are 11 months apart… I remember being RIGHT where you are right now! Wondering ‘What in the world were we thinking? !’ Questioning whether or not I could handle 2 under 2. They are now 4 and 5. Thank you so much for taking the time to read this! Also, thanks for sharing your experience. Your advice really helps me as well as far as just needing to accept that motherhood really is filled with both good and bad days and that’s just the way it is. I’m sure it gets easier as time goes by as well (I hope). 🙂 Well good luck to you, it sounds like you are doing amazing! I am reading this and I am having the same problem. But I have a 20 year old, 14 year old and 11 year old. Believe me when I say it is easier when they are smaller. I am actually at a point where I regret having kids. I know it sounds terrible, and I hate myself for saying it, but that is where I am at at the moment. You just manage to get through the problems with the one, then the problems with the next one starts. And in between the two, the 3rd one just make sure that you don’t forget to about them. Being a parent in this day and age is much harder than I think it was for our parents. Who (or what) do you think is to blame? I have 3 boys-17,12,&7. I still can’t find a balance between being their mother and finding myself. Being a single mother, I’m sad and frustrated most days and it’s tough to get through. It brings some comfort to know other moms are feeling as I do. Hopefully, in time, things will get better for all of us!